A space monster appears and begins terrorizing the Earth. This new creature happens to have an unncanny resemblance to the Futurain creation of a year ago: King Ghidorah. As a result, the space monster is dubbed with the same name. Humanity must now put faith in Godzilla to protect them, as the King of the Monsters must do battle with this new King Ghidorah. 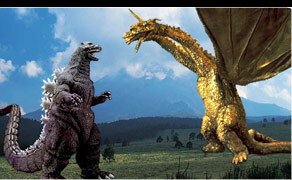 After the mild success of Godzilla vs King Ghidorah (1991), at least in contrast to the box office dissapointment that occurred in 1989 with Godzilla vs. Biollante, Toho was initially afraid to deviate very far from the 1991 film. Consequently, one of the first ideas for the next Godzilla film was one that once again pitted the King of the Monsters against his three-headed adversary, this time facing a King Ghidorah whose origin was more in tone with his Showa counterpart. The idea was eventually dropped, though, in favor of pitting Godzilla against Toho's second most popular creation: Mothra. The end result was the 1992 film Godzilla vs. Mothra, which ended up being the highest grossing Godzilla film to date and spurred Toho's increased support of the franchise. It should be noted that this would mark the second time the title The Return of King Ghidorah would be attempted for a screenplay, but this concept had no relation to the 1972 attempt.